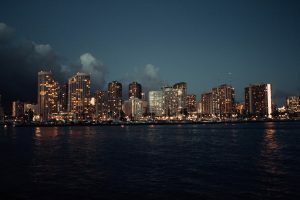 Vacationing in Oahu can get overwhelming with all the noise, the people, and the constant adventuring. After only a week of vacationing in Waikiki and I already felt like I needed some quiet time to collect myself. To give myself a much-needed break, I signed up for a free yoga class near the beach that doubles as a food drive. 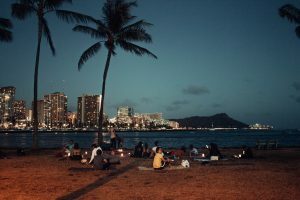 I took a quick 20-minute bus ride to magic island where I met with the others in the yoga class, placed my food cans in the wagon, and prepared myself for the session. 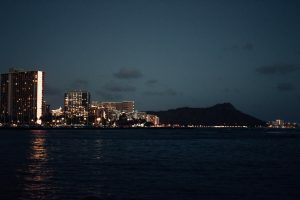 The atmosphere was as peaceful as it can get; the lights of Waikiki in the background, Diamond Head in the distance, the full moon glowing overhead, and the sound of waves nearby. The yoga instructor, Julia, created a great combination of mediation and stretching that allows beginner yogis to explore their flexibility and inner strength. And trust me, you will feel much calmer, at peace, and flexible when you leave the class. This class was definitely a major highlight of my time in Oahu. As well, knowing that you brought a food donation that will help families, veterans, and the homeless in the local area led me to love this event even more. Enjoy the tranquility of the ocean waves, full moon, and sea breeze as you better yourself and help those in need!